The Eastern Utah Wind Symphony, a college-community band at College of Eastern Utah, will appear in concert on Thursday, April 19 at 7:30 p.m. in the CEU Geary Theatre. Also performing will be two guest ensembles, the Dugway High School Band and the Whitehorse High School Band. 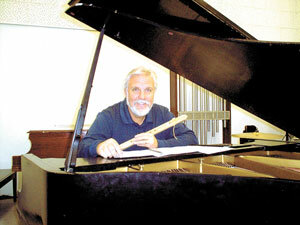 The Wind Symphony’s portion of the concert will include Windstar, a bold concert overture; Out of the Shadows, based on a Welsh folk song, “The Ash Grove”; and Fantasy on a Theme by Sousa, based on The March King’s “The Fairest of the Fair.” Wind Symphony conductor Gregory Benson is completing his eighth year at CEU and has worked with groups ranging from elementary schools to professionals over a career spanning more than 25 years. The bands from Dugway and Whitehorse high schools will spend all of April 19 at CEU engaged in joint rehearsals, informal performances, and campus tours. For the evening concert, the bands will combine to perform The Battle Pavane, an arrangement of keyboard music from the Renaissance period; Ashokan Farewell, from the PBS series, “The Civil War”; and Allied Honor, a stirring American march. The three selections will be conducted by Gregory Benson of Eastern Utah, Kim Schaefer of Whitehorse, and LeeRoy Nielsen of Dugway, respectively. A special feature of the April 19 concert will be the premiere of a new work by CEU composer and music professor, Russell Wilson. Four Mountains was commissioned by Whitehorse director of bands and 2007 Utah Teacher of the Year, Kim Schaefer. She had wanted for years to have a work written for her band at the reservation school, something that would reflect the Navajo culture. Wilson made trips to the high school in Montezuma Creek to hear traditional beats of drumming and singing. Some initial sketches were sent down, and the band members gave input and tried their hand at starting some melodies, which were later incorporated into the work. The new piece, in four movements, represents each of the mountains which bound the Navajo Nation. White Mountain in the East represents dawn and childhood, followed by the southern Blue Mountain, which is daytime and adolescence. In the West is Yellow Mountain, representing evening and adulthood. The final movement is about Black Mountain in the North, Hesperus Peak, representing nighttime and old age, reflection and prayer. The April 19 premiere of Four Mountains will be conducted by Russell Wilson and performed by the Whitehorse Band with selected guest musicians from the Eastern Utah and Dugway groups. The concert is sponsored by CEU’s music department.Admission is free.